Have you ever considered the prospect of sharing the space on your vinyl wrap with another business? Well, we definitely have! VIA Trading and Three Kids Laundromat experimented with this concept. These two businesses maximized the space on their vehicle with a two-in-one vinyl wrap that is guaranteed to catch attention. Via Trading is a wholesale closeout liquidator with cases, pallets, or truckloads of merchandise for “wholesalers, discount retailers, online sellers, flea market vendors, & more!” The physical store is open 5 days a week and the online aspect is accessible 24/7. Three Kids Laundromat promises no wait times and a clean, safe, family friendly environment. They also have massage chairs and arcade games on-site to occupy customers as they wait patiently for their laundry. These two businesses are somewhat dissimilar and cater to different markets and yet the vehicle wrap works well as a whole. Featuring two businesses on the same vehicle proves just how universal vehicle wraps can actually be. Vehicle wraps are traditionally utilized as just one wrap per vehicle to present a clear and concise branding message. However, we at Full Sail Graphics & Marketing know that this novelty dual vinyl wrap is going to generate business for both companies. Graphics a vehicle cast a wide net in terms of the clusters of people who see this advertising, rather than only reaching to a particular demographic. 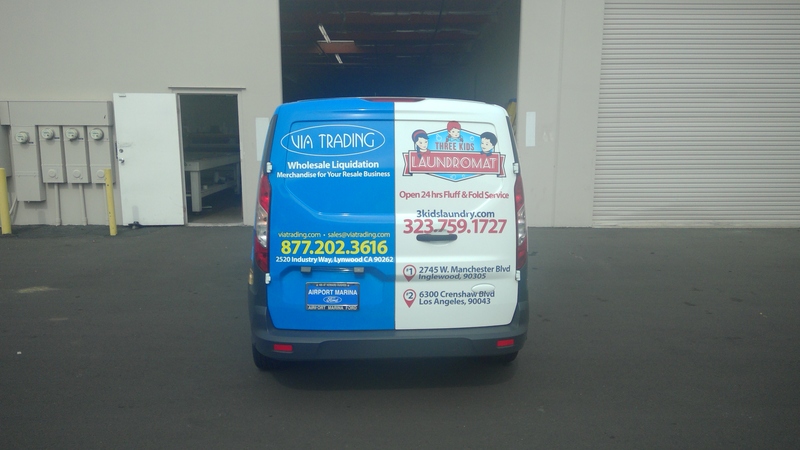 If a vinyl wrap works for the corporation that leads the online wholesale market and for a laundromat in Los Angeles, it will work for you! With over 50 years of combined experience in graphics and marketing, the Full Sail Graphics & Marketing team is confident that we will deliver quality graphics on time and on budget. If you are looking to enhance your brand, please feel free to give us a call at (714) 274-6706 or visit our website at //fullsailgraphics.com.